Gisborne/Tairāwhiti is fighting hard to win the Chorus Gigatown competition that ends this month. Like many around the country, I’ve been a bit cynical about the way Chorus decided to start Gigabit Ultra-Fast Broadband (UFB) rollout and the competition hasn’t helped my feelings much. 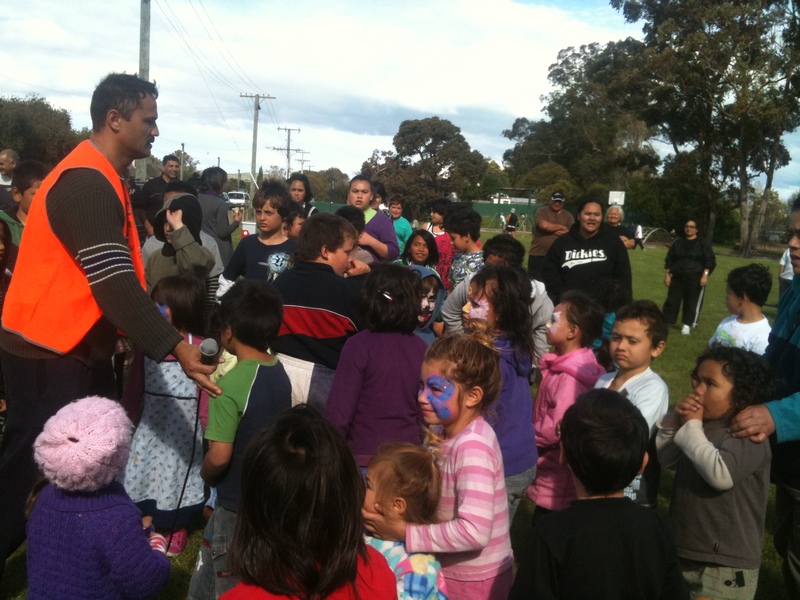 Having said that – while some of the social media and news stories almost seem to suggest that with the gig that no one will ever cry, no one will ever die in our special community should we win – I can see some real benefits if Gisborne is successful in securing the gig speed connection first. So as Project Manager for the Tairāwhiti Technology Trust, I’ve been keeping track of #gigatowngis social media progress and helping with the top secret ‘Plan for Gig Success’ that each of the final five ‘towns’ have to prepare and will be judged on by the country and an expert panel of judges. How Cities Are Fighting to Close the Digital Divide: Mashable. 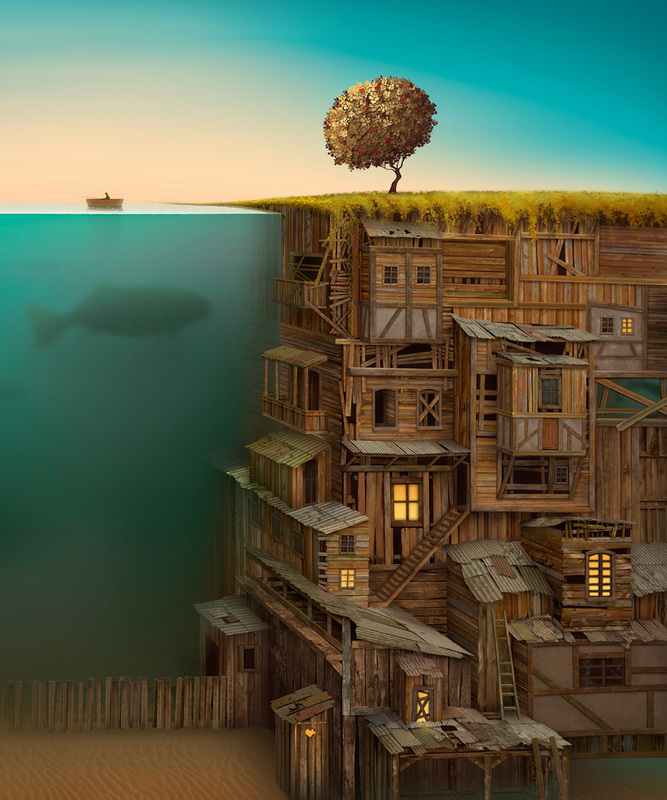 A short list of awesome initiatives to close the technology gap. of Information and Communication Technologies in Africa : African Development Bank. A milestone report suggesting Africa may leapfrog more developed countries in the information technology sectors, largely due to the lack of reliance on copper cables that ‘First World’ countries may be encumbered by. Technology and Inequality : MIT. A report examining why the disparity between the rich and everyone else is larger than ever in the United States and increasing in much of Europe. Concludes pretty much that new information technologies are likely to continue increasing inequalities rather than reducing them. Centre for Online Health : University of Queensland. A leading ‘IT for health sector’ research and development organisation. Looking to Get a Gig? You Don’t Have to Wait for Google [or Chorus] to Build it : Huffington Post. An interesting article on how citizen-owned public utilities companies (like Eastland Group) can do it themselves for our communities (in the US at least). With Google Fiber Sign-Ups Behind Schedule, Google Lowers Pre-Registration Thresholds : TechCrunch. Article reminiscent of the NZ experience where Chorus UFB take-up where it has been available, has been much slower than hoped for (by Chorus shareholders at least). Users don’t want gigabit Internet speeds, Time Warner Cable exec says : PC World. Article showing how some old-school corporate execs don’t get it, or don’t want to admit that if you build it, they will come (eventually). What Do You Do With the World’s Fastest Internet Service? : Slate. An overview introduction to Google Fiber Space showroom in Kansas City, the first city to get Google Fiber’s 1Gbps service. A weird video too. FCC chief calls for gigabit Internet in all 50 states by 2015 : ComputerWorld. 2013 article outlining the US equivalent of our Minister for Communications and Information Technology wants every state to have at least one city with the gig service by next year. I have enjoyed first term on Council, part of that was on the Chamber Executive and I’d like to see those links strengthened a little more as I think Brian Wilson and myself acted as a useful conduit between the Council and Chamber on a number of issues. I think I’ve been able to make intelligent, sensible and considered contributions to Council and I’ve helped raise the quality of discussion, debate and decision-making. I’ve had a focus on increasing public involvement in planning and decisions and been a strong advocate for the city and the district as a whole. I have listened to residents and ratepayers (even after being elected! ), worked well with others (who don’t always share the same values and views) and helped make good decisions in the best interest of the region as a whole. 1. What do you see as the GDC’s role in contributing to economic development and growth in this region? Advocating for the district at central government – ensuring our big issues are nationally significant issues. Facilitating relationships between stakeholders to realise opportunities and achieve sustainable solutions in the best interest of the district where there are competing priorities. Some of functions within these areas, particulatly information gathering and sharing, advocacy and relationship brokerage could be devolved to an Economic Development Agency run separate to Council. But the Mayor and Council have a critical leadership role in advocating on behalf of the region – especially on things like roading, new costs being imposed by central government legislation, etc. And political leadership can help broker mutually beneficial relationships with industry, iwi, land owners, research institutions, entrepreneurs, etc. Council can also have procurement and banking policies that benefit the local community in different ways. 2. What is your view of the core role of council? Do you consider there are any current council activities that do not fit this role? Under new legislation the purpose of local government is now to provide quality infrastructure, regulation & essential services. Opposition parties have pledged to revert the purpose back to promoting sustainable development and local cultural, environmental, social and economic wellbeing. I’m not completely wedded to Council providing social housing. I have argued it could be sold to a Charitable Trust, housing cooperative or something like ECT but wouldn’t want to see them go to private ownership. I’m also open to Council not owning any or all of its commercial assets (WOF station, holiday park, farms) if there are compelling financial reasons to divest from these enterprises. We need an urgent review of Council asset ownership to identify options and the benefits of retaining or releasing these enterprises. Tauwhareparae Farms are being well run but I’m not convinced we need to retain them. They were acquired to supplement port income and will always provide low value compared to capital committed, as the trees appreciate so will the capital value. There is no legal risk in selling them and my preference would be as Margaret Thorpe suggests to land-bank them via OTS as they are subject to Treaty claims. This will ensure we get a premium price, they are retained in local ownership and we demonstrate goodwill to the traditional owners. 3. Businesses have to live within their means, or face the consequences. What is your view with regard to GDC achieving the same discipline around keeping rates increases in check? Significant savings have been made by previous and current CEO to trim as much as possible. More ‘savings’ could be found but that depends on what we want to give up and what quality of life we can tolerate. I campaigned on rates rises at or below inflation and we have achieved that. The ‘razor gang’ didn’t make any significant savings. I also campaigned on getting more predictable rates system with smaller variations year on year and we are making good progress on this through the participatory rates review process. Council league tables suggest we are now one of the most financially sustainable and we rank 26 out of 73 councils for cost of rates. Councillors are financially conservative and understand the limits of affordability for residents, but the WMT suggests this is not the case. That massive blowout and the need to address some basic first suggest some of the fancy projects need to be reviewed while we attend to the basics first. If the community has things they think we should stop doing or not start they have the opportunity every year and we listen to that feedback. 4. What is your position with respect to the re-opening of the Gisborne to Napier rail line? The railway line a billion dollar public asset that is lying idle while Gisborne and Wairoa businesses scream out for it to make our products more competitive. Some people say logs will never go South on it but there are massive forests between Napier and Gisborne that will provide the anchor business for the line so that containerised seasonal produce and timber coming out and fertiliser going to Gisborne can be transported by rail instead of trucks. Coastal shipping is unlikely to ever be viable if the rail is operating. More trucks on the road means more cost in maintenance, more congestion and more danger for other motorists – it also means more cost for local businesses and more competition from other places that have lower freight costs. With the support of 10,000 signatures and $20,000 given by local businesses and residents, we commissioned a study that demonstrated the lack of rigor in the government’s position and the potential for a realistic business case if roads and rail were considered on a level playing field by central government. A different government next year will reinstate the line if the local business consortium is unable to raise the funds required. Some candidates say they don’t don’t support ratepayers funding the line operation – that has never been a realistic option – but Council could be a stronger advocate for the line. 5. If you were elected to the council, what activities or actions would you take to ensure Gisborne becomes an even better place to work, live and play? – continue emphasising the importance of opportunities for public input on issues like forestry harvest rules, petroleum exploration applications, legislative submissions, etc. – continue supporting illegal dumping prevention and removal, and more ambitious waste minimisation targets. – continue voluntary involvement in a wide range of community groups and local issues. Expecting ratepayers to fork out an extra $2.1 million dollars for the War Memorial Theatre without asking if they support the decision is unacceptable according to District Councillor Manu Caddie. 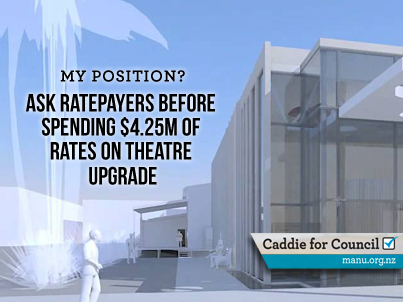 Mr Caddie was responding to news that the War Memorial Theatre upgrade will cost $9.6m instead the $7.17m budgeted and approved in Council’s Ten Year Plan. Staff and some councillors are recommending an extra $2.1million is borrowed because debt is lower than forecast and the expense is ‘therefore affordable’ and ‘not luxurious’. “I beg to differ. Spending an extra $2million of ratepayers money really needs to go to them before a decision is made” said Mr Caddie. Mr Caddie says he could be agreeable to upping the Council contribution to 33 percent which would require $1,050,000 of loan funds, but still believes it would require a special consultative procedure if the decision was to be made before the next Ten Year Plan. Mr Caddie says Council should go back to the organisations that have granted funds for the project so far. Mr Caddie said he is impressed with the external funds secured by Council staff and the War Memorial Theatre Trust and would be willing to help find the additional funds required from external sources. The matter will be debated by Council at their meeting next Thursday 5 September. 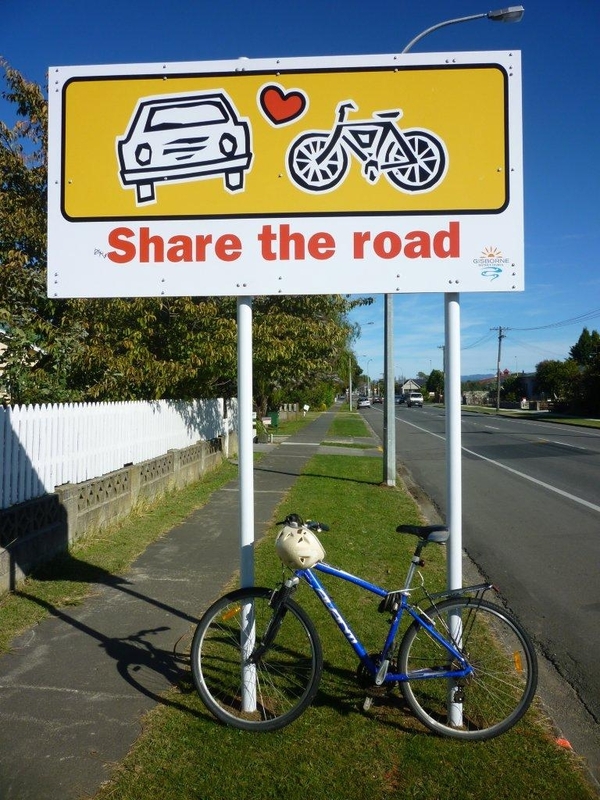 Yeah, Waikanae is not a commuter cycle route (well, probably half a dozen cyclists a day) but the point is we need to invest in commuter cycling infrastructure, get some baseline data on where we are at now and develop a concrete plan to see substantial mode change by 2020. News that work on the Kaiti to Wainui cycleway can now proceed has been welcomed by cycling advocates. Councillor Manu Caddie said he was very pleased that after 20 years a cycleway and walkway had finally found enough political support to get prioritised in the roading programme. 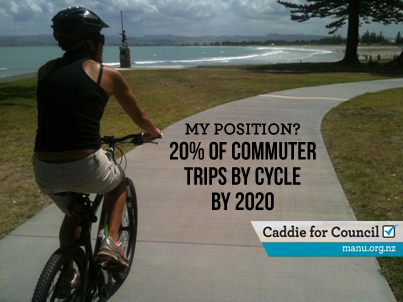 Mr Caddie said it was time for Gisborne to take the next step and develop a much bolder vision for commuter cycling corridors throughout the city. “We need to make this a cycling centric city – while logging truck size and numbers are going to keep increasing the trade off has to be serious investment in safe routes for cyclists and pedestrians” said Mr Caddie. Mr Caddie said the bulk of Council funds spent to date on cycling and walkways had gone into the recreational infrastructure but he wanted to see more attention paid to routes around the city for commuters. Funds for the Kaiti to Wainui cycleway will come from Regional Roading Funds after an assessment of costs to improve roads for heavy vehicles between Tolaga Bay and Matawhero found that only $1.5 million of $9 million available will need to be used for that project. The cycleway is the second highest priority project in the regional roading programme and an application to NZTA will be submitted in the next month and construction is expected to be completed this financial year. The project had been set to proceed three years ago but changes to the NZTA funding priorities set by the Minister of Transport meant further delays as cycleways are now considered a low priority by central government. The current Government Policy Statement for transport commits 50 times more on seven new highways than the total budget for cycling and walking infrastructure. Mr Caddie said he expected a few supporters of the cycleway to attend the Regional Transport Committee meeting at Lawson Field Theatre on Thursday afternoon where a paper noting the news is on the agenda. While the Cycle and Walkways have consistently been the most popular of the Major Projects in the Council’s Ten Year Plan, the Navigations Project has been one of the least popular and most controversial. Both projects are arguably about ‘placemaking’ and economic development – cycleways focus on making the city a more attractive, healthy and liveable city, the Navigations Project is more about telling local history stories to locals and visitors. Research recently published by an initiative called the Project for Public Spaces and promoted by the Institute of Public Governance at the University of California Berkeley has explored the links between placemaking and economic growth in communities. The research suggests creation of great public spaces is good for the economy, but only when it’s truly community-driven, open and inclusive. The more attached to a place local people are, the higher a city or region’s economic activity: “Placemaking, in other words, is a vital part of economic development.” True placemaking involves an open process that welcomes everyone who wants in, which provides the opportunity for residents — who may or may not know each other — to share ideas and be heard. The success of the cycle ways and inner-harbour development will depend on the level of ownership we all have in the planning and implementation of both projects. Gisborne District Council has not had a great history of fostering public participation in planning and decision-making, usually opting for the minimum required. In fact the Consultation Policy adopted in 2008 specifically excluded citizen empowerment from the continuum of public involvement. “Place Governance” on the other hand is a process by which decisions about places are made not from the top down, but by a collaborative process involving everyone. The Gisborne Fresh Water Advisory Group is a move toward this approach as it involves a wide cross-section of the community. However the FWAG falls short of real Place Governance because it is an exclusive group of organisations, meetings are not open to the public and the process is still controlled by Council. The key actors in a Place Governance structure are not official agencies that deal with a few prescribed issues, but the people who use the area in question and are most intimately acquainted with its challenges. Officials who strive to implement this type of governance structure do so because they understand that the best solutions don’t come from within narrow disciplines, but from the points where people of different backgrounds come together. I know some residents along the Taraheru River are concerned about how a boardwalk from Campion College to Grey Street may impact on the views, river access, tranquility and largely unspoiled riverfront they currently enjoy. While this project is on hold for the time being it will be essential for the residents, river users, iwi representatives, walkers and cyclists to work through how we can best utilise the public spaces along the river as this project proceeds. And I’m confident Council will ensure that happens. Over $5,000 already donated in 24hrs! East Coast rail supporters are trying to raise $10,000 by Tuesday to have the KiwiRail report independently peer reviewed by one of NZs most respected independent economic analysis companies. “Of course it should be KiwiRail and/or the Government that pays for such a review but we don’t want to wait another six months for that to happen” said Gisborne District Councillor and Rail Action Group member Manu Caddie. After sending an appeal last night, Mr Caddie said about $3,000 has already been pledged and he is hoping Gisborne, Wairoa and Hawkes Bay residents will help reach the goal. 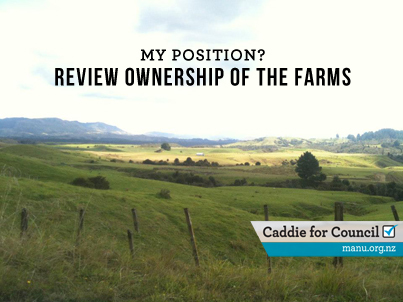 Instead of focusing on adding a few passing lanes to the highway, Mr Caddie believes pressure needs to remain on ensuring rail is retained because products from Gisborne and Wairoa region are going to become less competitive if the efficiencies of rail freight are not available for local producers. The Tairawhiti Environment Centre is holding funds for the Rail Report Review. If anyone wants to make a donation towards the report review, they can make a bank deposit at ANZ or online, the account number for donations is 01-0641-0058800-00. 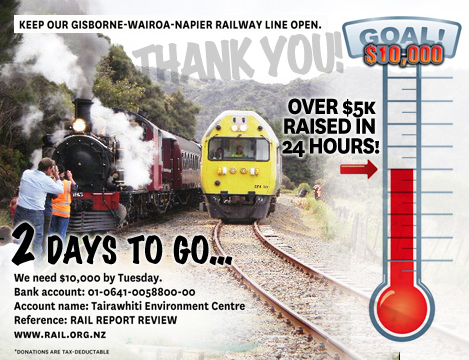 Cash or a cheque can be sent to PO Box 1376, Gisborne 4040 (cheques should be made out to Tairawhiti Environment Centre, but enclosing a note that the donation is for the Rail Report Review). 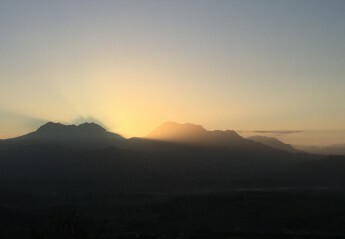 Tairawhiti Environment Centre is a charitable entity, so donors should include their name and address, so they can be sent a tax deductible receipt.